Bushwalking an ideal sport for those who seak adventure. Bushwalking is also known as hiking, or simply walking and enjoyed by those who love the outdoors. Australia a land of extraordinary beauty covered with vegetation, animals, birds, scenic beauty added more to its Bushwalking. Bushwalking is one of the major tourist attractions of Australia. 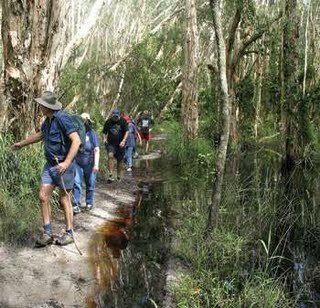 Queensland, Tasmania , New South Wales and Victoria are among the favourite bush walking spots of Australia. If you went to Tasmania then March and April are ideal time to visit and If Victoria then April to June is the best suitable time. While walking through bush you can see the natural beauty of rainforests with large trees. Some people love to take bath in waterfalls come in the way of bushwalking. Also you can know here about the regions most popular flora and fauna while walking through trails. Dorrigo National Park has some finest track ideal for bushwalking having stunning views. Tasmania has some of the most sought after bush walking destinations. Tasmania is the world`s most mountainous island. Some of them are 1600 metres high. The Wilderness World Heritage Area comprising Wild Rivers, Walls Of Jerusalem, Cradle Of Mountain etc. The most famous track is the Overland Track. West Australia also attracts a number of bush walking enthusiasts from all across the world. Covered with exotic flora and fauna, group of mountains etc. The Bibbulmun Track, Bungle Range, Kimberley , Pilbara are some of the top of the line haunts and make your trip a memorable one. Yanchep National Park offers diversity of flora and fauna and the bushwalker enjoy a lot here. Queensland is one of the popular place for bushwalking. The climate is mainly tropical here. April to September is the best time to visit for Bushwalking. Some of the famous areas are Lamington National Park, Border Ranges, Carnarvon Gorge, Cooloola National Park, Sundown National Park, Girraween National Parks, Fraser Island, Boonoo National Park etc. Mt. Barney is the most impressive park for bushwalkers. This is the highest mountain in southern Queensland. Mount Bogong is the most popular track in Victoria. Summer, early autumn and late spring is the perfect time to visit. Mount Feathertop is next famous place for bushwalkers. It is also second highest summit. Actually Bush walking is a way to know Australia better, whether its wildlife, its species, flora & fauna, culture, and much more. Bush walking is a good exercise because walking through trails you can take fresh air which helps to make you healthy and your mind be fresh. If somebody new to the place they can take help from Bushwalking clubs. They help you to make your trip to bushwalking more easy. Overall if you want something different and new experience then definitely try Bushwalking. You will surely enjoy, explore Australia and have fun with your dear ones. Australia is one of the safest countries for hikers and backpackers. Although there are a few spiders and snakes, there is nothing in the bush that will eat you.